World Equivalent Carbon,... Offshore steel standards..
Grade 355 TMCP - Comparison of Tensile Strength, Yield Strength and Toughness. 355 N and TMCP - Comparison of Yield to Tensile Strength. 420 / 450 / 460 - Chemical Compositions. 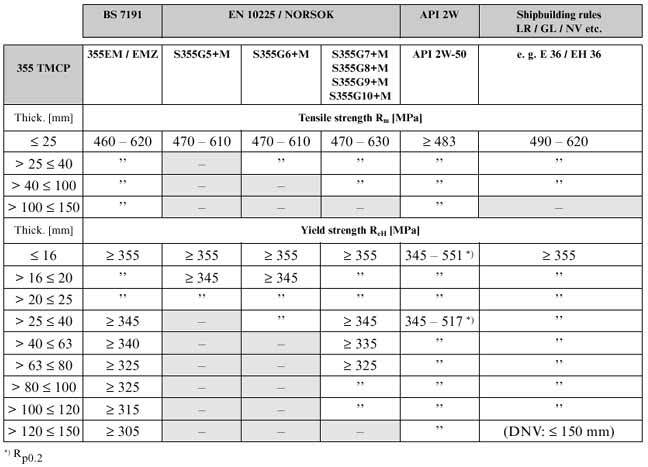 420 / 450 / 460 TMCP - Comparison of Tensile Strength, Yield Strength and Toughness. 420 / 450 / 460 Q+T - Comparison of Tensile Strength, Yield Strength and Toughness. 420 / 450 / 460 TMCP and Q+T - Comparison of Yield to Tensile Strength Ratios. Weldability qualification of Dillinger Hütte. Steel with Cr., Mo., Cr-Mo. 1) To add NF A 45-001 and NF A 45-101 for the tolerances. which describe the severe requirements on structural steel plates for offshore constructions. The standards prEN 10225, BS 7191 and the material data sheets of NORSOK (Norwegian standard) are primarily applicable in Europe (North Sea). The API-standard is mainly applied in American and Asian areas. However, the different standards may also be used in other areas. In some parts, the standards correspond to each other. So, the Norsok standard refers to the prEN 10225 which itself is based on the BS 7191. The more the standards approach each other, the easier it will be for the steel fabricator to develop together with the engineering companies improved steel grades in an economic way. 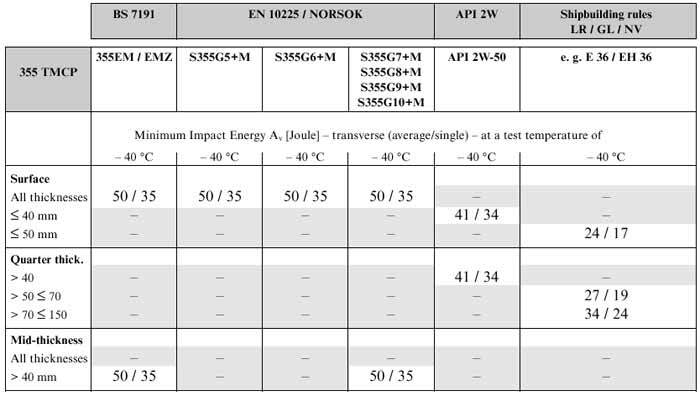 Here you will find a comparison of the steel grade 355 in the delivery conditions normalized (N) and thermo mechanically rolled (TMCP) and also of the steel grades 420, 450 and 460 in the delivery conditions thermo- mechanically rolled and quenched and tempered (Q+T). The comparison is based on the latest revisions of the mentioned standards at the date of this issue. *) Furthermore, you will find all weldability qualifications of Dillinger Hütte for offshore grades and all approvals for ship-building grades. *) Remark: In order to ease the use of this document the supplementary requirements of the different standards are not listed. Grade 355 / API 2H and 2W - Chemical Compositions. LR / GL / NV etc. > 25 ≤40 " " " " " "
thickness in Dillinger Hütte: 75 mm (According to API RP2Z, if suppl. S11 is chosen) *) Several grades require a weldability qualification according to a standard or an approval of a classification company, which is necessary for a delivery. submitted to our Quality Department. conflicts the original standard has to be applied. Individual feasibility and combination of grades are a matter of an inquiry. (e.g. E36 or E40) require a formal approval by the relevant classification company.